Police are investigating whether a fire that broke out on Wednesday evening, January 31, at the Tel Aviv headquarters of Hadash and the Communist Party of Israel (CPI) was the result of arson. 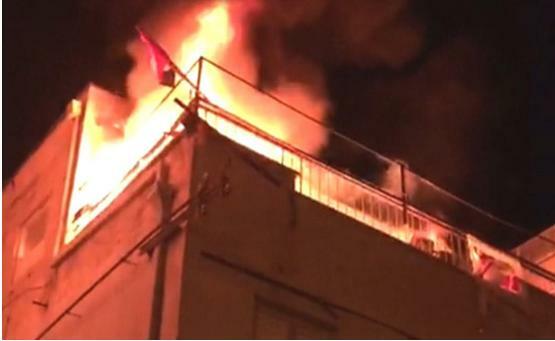 A group of youth activists of the Young Communist League (Banki-Shabiba) had been working inside the building when they noticed the flames on the second floor of the three story building on Ahad Ha’am Street in Central Tel Aviv. They were able to evacuate the premises without any injuries, a party spokesperson said. “The fire broke out in a hardware shed on the second-floor balcony,” Hadash Tel Aviv branch secretary-general Attorney Noa Levy told journalists. “African workers in nearby cafes came running in and told everyone to evacuate.” “We are waiting for the police. We have still not heard anything specific,” she added. CPI Demands Freeing of Sudanese Communist Party Comrades, Now!